Frankly, this horny teen counselor would be better off if a slasher-killer were stalking his summer camp. It would give him more time to hook up. Unfortunately, fending off a horde of zombies with a collective conscience will demand his full attention. He understands this only too well because he was once part of the titular Borg-like group-mind of David Yarovesky’s The Hive (trailer here), which The Nerdist presented this Monday as a special one-night Fathom Event screening, in advance of a later VOD release. Adam is more notorious than he realizes for being the player of the camp. Katie is pointedly unimpressed with his attempts to impress her, especially when his clumsiness lands them both in the infirmary. However, a little time in close quarters warms her to the idea of a bit of fooling around. In a case of super-bad timing, they are interrupted by the crash of an apparent military aircraft. Foolishly setting out to investigate with Clark and Jess, another camp counseling couple, they find a really bad scene. Let’s just say there is a zombie-acting pilot and puddles of black goo. Of course, they bring that contagion back to camp. Logically enough, the principle means of spreading the contamination is through projectile vomiting to the face. Before long, all four get tagged, even Adam. Yet, he seems to have somehow snapped out of it, judging from the film’s flashback structure. On the downside, he seems to have lost his memory, at least in a continuous narrative form. He gets flashes of the previous day, as well as bits and pieces that seem to be other people’s experiences. 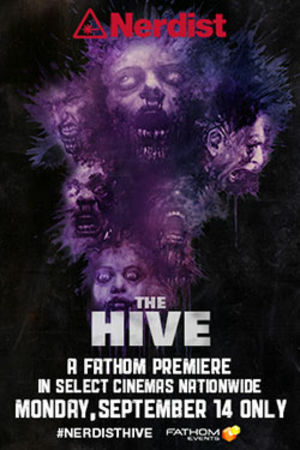 Arguably, The Hive owes as much Cabin Fever as it does Night of the Living Dead, but Yarovesky and co-writer Will Honley still put an intriguing spin on the viral-mutant doomsday scenario. While completely apolitical, in contrast to Ladd Ehlinger Jr’s sly, under-appreciated, thematically related Hive Mind, the individual versus the collective motifs greatly enrich Yarovesky’s The Hive. Basically, it is like Adam is stuck at a Bernie Saunders rally, except there is slightly more black sludge vomiting, but only just slightly. In fact, the whole mechanism through which he disconnects from the Hive is well thought out and convincing. Still, it must be said, the staticky, rough-cut flash-forwards and backwards get a bit tiresome after a while. Gabriel Basso and Kathryn Prescott are also surprisingly engaging as Adam and Katie. They actually develop legitimately tragic romantic chemistry, which is something you never expect to find in a teen zombie movie. The camp ground set also look totally authentic, as it should. According to the pre-screening infotainment slides, Yarovesk hired the facilities manager of his own childhood summer camp to recreate its look. For the Fathom Events screening, Nerdist also produced half an hour of special supplemental introductory matter, including a report from the Mr. Wizard Nerdist on the swarming behavior of birds and insects that provided some helpful context. The Hive has plenty of dark humor and slimey grossness, but it also has heart and a bit of brains. That is a full bill, really. 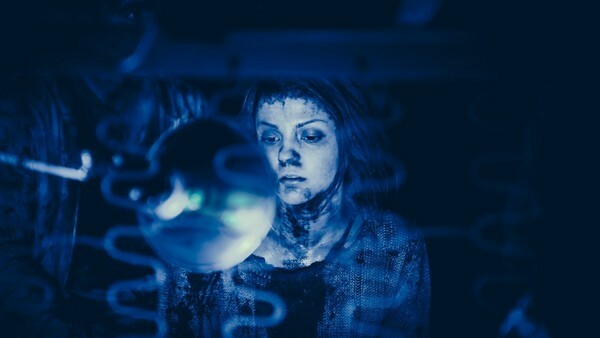 Cult film connoisseurs need to catch up with it, so hopefully Nerdist and Fathom will schedule an encore screening before its promised VOD release.